German sportswear firm Adidas has said it is ending its sponsorship of English football club Chelsea six years early. Adidas, which has sponsored Chelsea since 2006, said it had reached a mutual agreement to end the deal on 30 June 2017 instead of 2023. 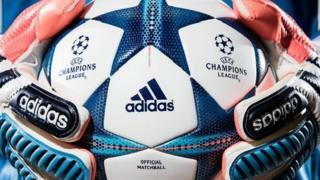 The club will have to pay Adidas tens of millions of euros in compensation, but is free to sign a new sponsor. The payment means Adidas profits are expected to rise 25% this year rather than the 15-18% originally forecast. Adidas has said it is developing a new marketing strategy based around fewer teams, top individual players, digital media and grassroots campaigns. The company said in a statement: "Adidas... wishes to expressly thank Chelsea Football Club for their always professional and successful collaboration, which has included, among other successes, the time of their UEFA Champions League title in 2012 as well as two Premier League titles." Its deal in 2013 with Chelsea, reported to have been worth £300m, was the biggest shirt deal in Premier League history. However, Adidas broke its own record the following year, when it agreed to pay £750m to replace its US rival Nike as sponsor of Manchester United. It has also taken over from Nike at Italian champions Juventus, while extending its contract with Germany's number one team Bayern Munich. The identity of Chelsea's next kit manufacturer has not been revealed.